Kate’s looking for Maxie but doesn’t find her at her desk. Sonny shows up asking Kate. He wants her to go away with him for a couple of days and gives her a gift. When it turns out to be a bikini, she says she doesn’t want to go to the island with him. He tells her he wants to take her to the Dominican Republic. She realizes he’s going there to divorce Brenda. She doesn’t want to be the consolation prize. She doesn’t want to be his rebound girl. Maxie and Matt are in Crimson’s closet, trying to find an outfit for the photo shoot. She strips down to her skivvies to try on a dress, much to Matt’s enjoyment. They start to make out, when Kate catches them. However, she just wants Maxie to be careful with the dress. After she’s gone, they continue to fool around among the clothes and Matt admits he’s missed her. Jason’s screaming on an answering machine that he’s going to kill Franco, but the machine eventually cuts him off. Shawn shows up at Carly’s. She asks him over for Thanksgiving and he accepts. He jokes they still need to make the police think they’re an item. Jason stops by and Shawn leaves them to talk. Jason lets Carly know she was right. Franco was in Hawaii, he left a dead body and his signature behind. Carly hopes Franco comes at her, so she can do something to him for what happened with Michael. Jason blames himself for everything, since he didn’t kill Franco when he had the chance. He’s upset he took Sam to Hawaii and it turned into a trap. Carly doesn’t blame him. She says it was Sam’s choice to stay. Jason finds one of Franco’s cameras. Carly says Josslyn had it on their return. 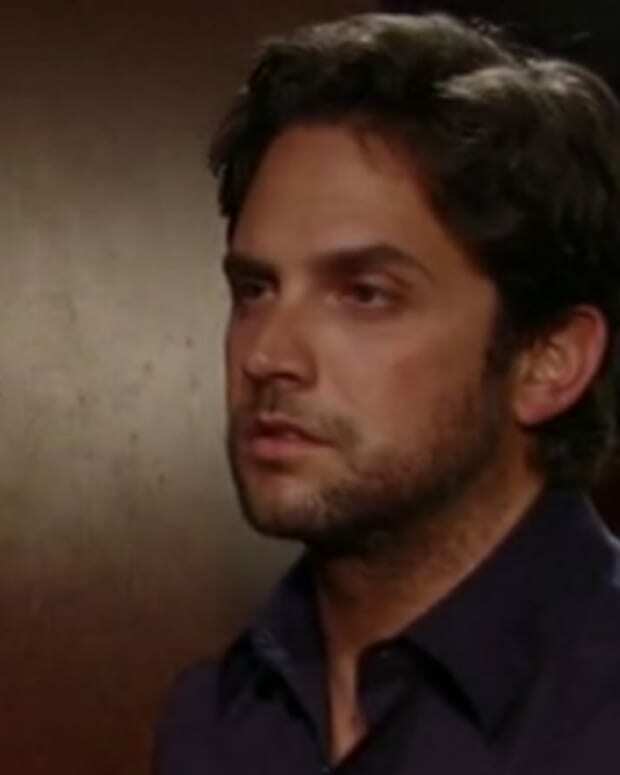 When Shawn returns, he admits he knew about Franco. Jason called ahead for him to keep an eye on Carly. Sam’s hanging out on her balcony, when someone walks up behind her. She grabs them and almost tosses them over, only to realize its Michael. She apologizes, saying she didn’t hear him come in and she’s a little jumpy. Michael wonders why her honeymoon didn’t relax her more. Michael figures it’s because Carly crashed the honeymoon and Sam agrees. She wonders why he’s looking for Jason. Michael tells her the Vaughn girls are being attacked after hours. Dante isn’t looking into it fast enough for him. Sam offers to look into it, saying she needs something to do and wants to stop this guy from hurting the women. She figures it brings up bad memories for Abby. Michael admits it reminds him of being ashamed and powerless in prison. For the longest time he tried to forget and pretend it didn’t happen. Sam figures it’s better to remember, because those who are drugged don’t remember, can’t confront it and move on. Sam assures him she’ll find whoever is doing it. Monica stops by and invites Michael to Thanksgiving dinner. He says he’s going to Carly’s. She says Edward would love to see him and he offers to stop by for dessert. After he leaves, she invites Sam and Jason to dinner. Sam promises to mention it to Jason. Monica says she was surprised to see them back from their honeymoon so soon. Sam says Jason needed a check up, but Monica says he didn’t end up getting it. She explains about what happened with Liz. Monica feels it’s not Jason’s job to take care of Liz, but that Sam is his priority now. Jason gets home and Monica issues the invitation. Jason starts to blow it off, but Sam says she thinks it’s a great idea and it would be nice to spend time with his family. Diane stops by Sonny’s to give him divorce papers from Brenda. It’s her last act as his attorney. Diane is surprised at Sonny’s lack of anger, but he says his marriage was over when Brenda left. He admits he went crazy, but says it’s because Brenda left with Jax. He’s now trying to move forward. She warns him that dating Kate is a step backward and not to do it. Sonny signs the papers. Carly’s angry with Shawn. She says every time she gets close, she finds out it’s only a job to him. He admits he enjoys her company, but also has a job to do. She wonders about the story he told of his father. She wonders whether he only said it to keep her close. Carly asks if she makes him uncomfortable. She cares about him and wonders if it’s more than just a job. Shawn assures her she’s more than just a job to him. Sonny sends a package to Kate. Kate calls him, wondering if he’s going to send her something every hour until she agrees to go away with him. Sonny tells her to open the package, which turns out to be a scarf. He tells her he’s doesn’t need to go to the Dominican now. He signed Brenda’s divorce papers. Kate tells him she can take a few days off, but doesn’t want to go to the island. He wants to take her where it all started. Kate finds Matt and Maxie still in the clothes closet and threatens to fire her, but offers to give her a second chance. Kate tells her she’s going away for a few days. Sonny comes out of his office, as Jason’s angrily knocking over a chair. He says he’s angry because they still haven’t found Franco. Sonny tells Jason he’s going away with Kate and wonders why Jason doesn’t really react to that. Jason feels that Kate is good for him. Sonny admits to the divorce papers. He wonders if Jason will be ok. Sonny says he understands if Jason feels helpless. He can’t win with Franco, but reminds him that psychos die like everyone else and to take care of it. Jason says that just because their dead, doesn’t mean you’re free.